Buttercup squash is a member of the curcubita maxima family, along with Blue Hubbard and Kabocha. The buttercup is a flat squat turban shaped squash that ranges between three and five pounds. Buttercup is perfect for roasting and pureeing into your favorite recipe. The flavor is sweet and nutty and the texture, once cooked, is similar to a sweet potato. The buttercup is low in calories and chock full of vitamins A, B, and C, calcium, protein and fiber. You can’t beat this powerhouse squash for an all around healthy and easy to use ingredient. Look for a smooth unblemished skin and a nice heaviness to the squash. Remember to store your buttercup squash in a cool dry place before cooking. Most farmers markets will have the buttercup squash; this one came from Hilltop Hanover Farm. For something a little different than the typical pureed soup, this recipe takes the buttercup squash and adds it to the soup stock after a little roasting. The squash will gently fall apart in the soup, while still keeping it’s shape. With the addition a some pretty rainbow chard you get a stunning Fall dish that tastes as good as it looks. This weekend you will have the perfect opportunity to taste our Seasonal Chef’s new creation at the Irvington Farmer’s Market on Sunday November 2nd. Come and see her demo this quick and easy soup from 11:00-1:00 pm. Preheat the oven to 375 degrees. Trim the top and bottom of the buttercup squash and quarter it. Scoop out the seeds and peel the skin. Carefully cut the squash in 1” chunks. Try to keep them all the same size if possible. Place on a rimmed baking sheet. In a small bowl combine 1 teaspoon each of coriander and kosher salt, ½ teaspoon each of black pepper and chili powder, and half of the orange zest. Combine with your fingers. Drizzle 2-3 tablespoons of oil over the squash and sprinkle the spice blend. Using your hands toss the squash chunks until they are all coated with the oil and spices. Place in the preheated oven and bake for 15 minutes. Remove and set aside. While the squash cooks place a small heavy bottom pot over medium heat and saute the shallot and garlic with ½ teaspoon each of salt and pepper and 2 tablespoons of olive oil. Saute for 2-3 minutes or until the onions take on a golden color. Add the chard stems and cook for another minute. Add the chard leaves and cook for about 2 minutes until they wilt a little. Add the stock, the rest of the orange zest, ¼ cup of the juice and another ¼ teaspoon each of salt, pepper and chili powder. Mix gently and let the pot come up to a low simmer. Your squash should be done just about the same time. Add 3 cups of the cooked squash cubes to the pot. (Save the rest for another dish.) When the squash simmers in the pot it will start to break down slightly. What you want is to still be able to see the chunks, albeit smaller now, in the pot. If you still have huge pieces take a wooden spoon and press them gently against the pot. Taste for seasoning and serve warm. Buttercup squash is easily found at the farmers market and also the grocery store. Buttercup is a dark green squat squash that is relatively smooth and easy to peel. 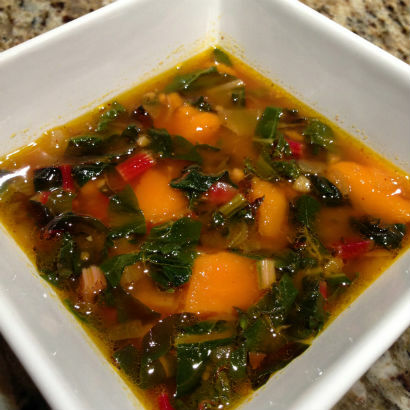 Kabocha squash would be the closest to it in texture and taste. For this recipe you will only need 1½ pounds of uncooked squash, but generally they are 3 - 5 pounds. Go ahead and roast the whole buttercup and save the leftover squash for another time. Once cooked the squash freezes easily in plastic pint containers. 1. Preheat the oven to 375 degrees. Trim the top and bottom of the buttercup squash and quarter it. Scoop out the seeds and peel the skin. Carefully cut the squash in 1” chunks. Try to keep them all the same size if possible. Place on a rimmed baking sheet. 2. In a small bowl combine 1 teaspoon each of coriander and kosher salt, ½ teaspoon each of black pepper and chili powder, and half of the orange zest. Combine with your fingers. Drizzle 2-3 tablespoons of oil over the squash and sprinkle the spice blend. Using your hands toss the squash chunks until they are all coated with the oil and spices. Place in the preheated oven and bake for 15 minutes. Remove and set aside. 3. While the squash cooks place a small heavy bottom pot over medium heat and saute the shallot and garlic with ½ teaspoon each of salt and pepper and 2 tablespoons of olive oil. Saute for 2-3 minutes or until the onions take on a golden color. 4. Add the chard stems and cook for another minute. Add the chard leaves and cook for about 2 minutes until they wilt a little. Add the stock, the rest of the orange zest, ¼ cup of the juice and another ¼ teaspoon each of salt, pepper and chili powder. Mix gently and let the pot come up to a low simmer. 5. Your squash should be done just about the same time. Add 3 cups of the cooked squash cubes to the pot. (Save the rest for another dish.) When the squash simmers in the pot it will start to break down slightly. What you want is to still be able to see the chunks, albeit smaller now, in the pot. If you still have huge pieces take a wooden spoon and press them gently against the pot. 6. Taste for seasoning and serve warm. Cook’s Note: Buttercup squash is easily found at the farmers market and also the grocery store. 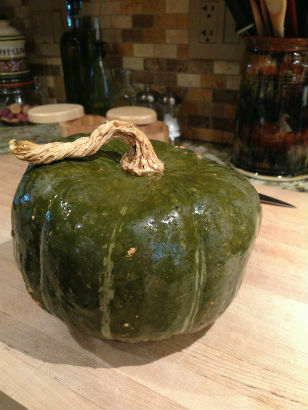 Buttercup is a dark green squat squash that is relatively smooth and easy to peel. Kabocha squash would be the closest to it in texture. A small 1 – 1½ lb squash is perfect for this recipe, but generally they are 2-3 lbs. If you have any left over save it for another recipe. Cooked squash freezes easily in plastic pint containers. This recipe was created by Maria Reina, of Bella Cucina Maria and Seasonal Chef for Small Bites at LoHud.com.